RENO, NEVADA, UNITED STATES, January 9, 2019 /EINPresswire.com/ -- (Reno. Nev.) – The National Council of Juvenile and Family Court Judges (NCJFCJ), a judicial education membership organization, has been named an honorable mention recipient of PR Daily’s 2018 Nonprofit PR Awards in the Annual Report category. Ragan Communications and PR Daily run 11 awards programs each year, including the PR Daily Awards, the Employee Communications Awards and the Video and Visual Awards. Judged by globally regarded experts and featuring multiple categories, these programs honor the top work in communications, PR, marketing and media. PR Daily’s Nonprofit PR Awards celebrates the teams, organizations and consultants who have redefined the field with their groundbreaking work. As an honorable mention recipient in the program, the NCJFCJ joins an elite group of past recipients, including the Pew Center for Arts & Heritage, Oceana and the United States Geospatial Intelligence Foundation. The NCJFCJ was chosen from a wide pool of entries to receive an honorable mention in the Annual Report category for the impact of its work. 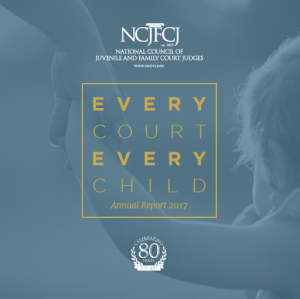 The NCJFCJ Annual Report focused on its progress and accomplishments in juvenile justice, child welfare, family violence and domestic relations. The NCJFCJ featured how it moved the needle in the last year with its audience through data and results. It demonstrated statewide, national and international impact to show how NCJFCJ is meeting the needs of its member base. Founded in 1937, the Reno, Nev.-based National Council of Juvenile and Family Court Judges, is the nation’s oldest judicial membership organization and focused on improving the effectiveness of our nation’s juvenile and family courts. A leader in continuing education opportunities, research, and policy development in the field of juvenile and family justice, the 2,000-member organization is unique in providing practice-based resources to jurisdictions and communities nationwide. To become a member, visit ncjfcj.org. The Chicago-based company also covers the health care industry on HealthCareCommunication.com. Ragan is the leading provider of conferences and online training for PR, media relations and corporate communications professionals.